In Game 6, however, Rockets center Hakeem Olajuwon blocked a last-second championship-winning shot attempt by John Starks, giving the Rockets an 86–84 victory and forcing a Game 7, which made Knicks Coach Pat Riley the first (and to this date, the only) coach in a Game 7 NBA Finals on two teams, having been with the Los Angeles Lakers in 1984 and 1988. In addition, the Knicks set a record for most playoff games played in one season, with 25. The Detroit Pistons tied this record in 2005. The Boston Celtics, coached by Doc Rivers, would surpass it during their championship season of 2008 when they played 26. The Rockets beat the Knicks in Game 7, 90–84, enabling the city of Houston to not only celebrate its first NBA and fifth professional sports championship (first in an existing league), but also deny New York from having both NBA and NHL championships in the same year (Chicago had suffered this fate two years earlier in 1992, with the Bulls winning their second NBA championship and the Blackhawks losing in the Stanley Cup Finals). For his efforts Olajuwon was named NBA Finals Most Valuable Player. For the Knicks, Riley had the unfortunate distinction of having become the first (and to this date, the only) coach to lose a Game 7 NBA Finals on two teams, having lost to the Celtics in 1984. It also denied him the distinction of being the first coach to win a Game 7 NBA Finals with two teams, having defeated the Detroit Pistons in 1988. Rangers Captain Mark Messier attended the game, bringing the Stanley Cup in a bid to inspire the Knicks, first to their locker room before the game, and again out onto center court at halftime, much to the delight of fans. During NBC's broadcast of Game 4, Marv Albert, who himself handled the radio call of the Rangers' win, and Matt Guokas mentioned the Rangers' win and that the Knicks were happy that their arena was "the scene of one of the glorious moments in the history of New York sports." The Rockets would repeat as NBA champions in 1995 although their season record wasn't so promising. Plagued by a lack of chemistry, the Rockets were stuck in the middle of the conference standings most of the year. Then, as the NBA's trading deadline approached, on February 14, 1995, the Rockets acquired Hakeem Olajuwon's "Phi Slama Jama" teammate Clyde Drexler. The Rockets finished the regular season as the 6th seed but the team on the court at season's end was clearly better than its 47–35 record. The new Rockets team had only had about two months to gel. The playoffs started rough for Houston, the team down 2 games to 1 to Utah in the First Round. However, the Rockets battled back and won that series, stealing the deciding Game 5 in Utah. The Rockets' ability to overcome adversity became more evident as the postseason wore on. They beat four 50-win squads (Utah, Phoenix, San Antonio and Orlando) to win the NBA championship, becoming the lowest seed ever to win it all. Also in 1995, the Knicks enjoyed another strong season, with 55 wins. However, they were eliminated in seven games by the Indiana Pacers during the second round as Pacers guard Reggie Miller's 'Knick Killer' legacy continued. After the season Pat Riley departed for the Miami Heat, with whom he would win three championships. The Knicks would make the finals again in 1999, but fell to the Spurs in five games, and have not returned since. ^ Araton, Harvey (June 23, 1994). "ON PRO BASKETBALL: N.B.A. FINALS; Long-Sought Title That Ewing Needed Eludes Him Again". The New York Times. Retrieved April 1, 2008. But he (Ewing) was just not as good as Hakeem Olajuwon, never has been. ^ a b "History of the NBA Finals: Hakeem Olajuwon: The NBA's Best In The Mid '90s". hollywoodsportsbook.com. Retrieved February 16, 2007. ^ "Patrick Ewing Bio". NBA. Retrieved April 19, 2007. ^ a b Beck, Howard (June 17, 2008). "Celtics Remain Mindful Of a Missed Opportunity". The New York Times. p. D2. Retrieved 20 June 2010. 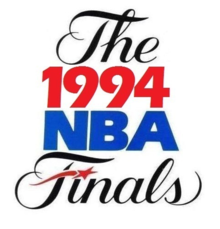 ^ a b NBA on NBC: Game 4 of the 1994 NBA Finals (television). NBC. June 15, 1994. ^ Zipay, Steve (June 14, 2009). "'94, a vintage year for Rangers, Knicks; Rangers ended 54-year Stanley Cup drought". Newsday. p. A78. Retrieved September 7, 2009. ^ MacMullan, Jackie (June 18, 1994). "Knicks pull away, close in on crown". The Boston Globe. p. 33. Capping a day when their fellow New Yorkers celebrated the Rangers' Stanley Cup with a parade, the Knicks were always there, keeping pace. ^ Barron, James (June 18, 1994). "New Yorkers Bury the Rangers' Curse in a Sea of Confetti". The New York Times. p. 28. Retrieved 28 February 2012. ^ a b Blinebury, Fran (June 13, 2004). "BELIEVE IT: 10 YEARS LATER; 'The Times of Our Lives'". The Houston Chronicle. p. 1. ^ Hahn, Alan (June 14, 2009). "After huge effort, Knicks fall short". Newsday. p. A79. Retrieved September 7, 2009. ^ Brett Morgen, Director (June 16, 2010). 30 for 30: June 17, 1994 (television). ESPN.